With World Water Day 2009 coming up on Sunday 22nd March, Excellent Development, our project partner in Kenya, have been conducting some interesting research into the contrast between the massive choice of bottled water we have here in the UK compared to the limited access to a clean water supply faced by rural villages in the Machakos district of Kenya. According to Simon Madrell, co-founder of Excellent Development, consumers in the UK face a mind-boggling choice between 57 different brands of water, with the average price per litre at £3.40 (the highest being a ridiculous £59 per litre and a favourite of celebrities such as Paris Hilton). It is a choice that we rarely give a second thought to, however within the communities Excellent Development works with in Kenya the availability (or lack of it) of water is forefront in most minds. Community built sand dams not only provide a sustainable source of clean water but also improves the surrounding environment, raising the local water table leading to increased tree and crop survival rates. A sand dam will provide water for a community at a cost of just over half a penny per litre and is refilled for free every time it rains! Read the Excellent Development article here. 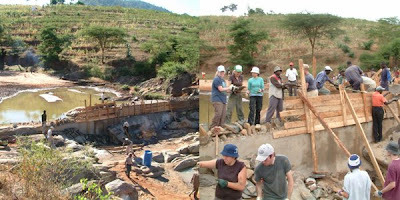 Find out more about constructing sand dams on our Kenya WaterRelief Project! This is crazy, The Liger! and Tigron! Countdown to Chicken Week! 3days to go! !